Happy Friday friends! 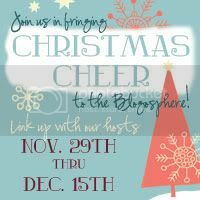 Christmas is creepin' up rather quickly and I'm pretty excited to share with you a super fun and festive Linkup party! 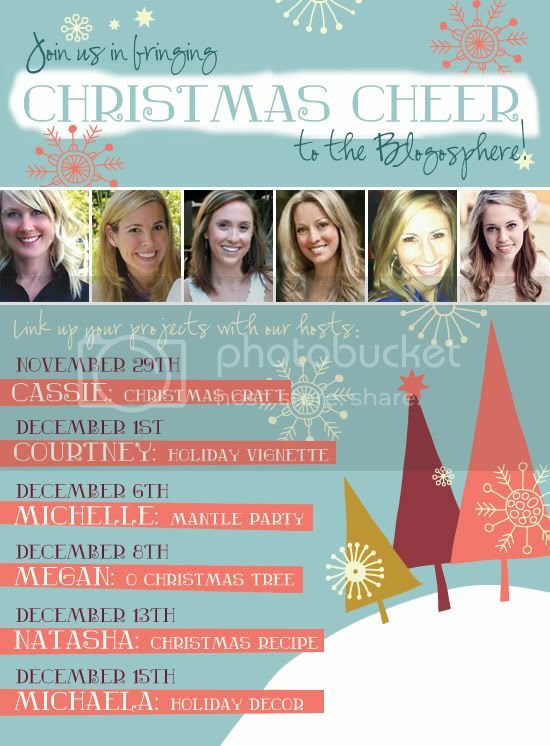 Some of my favorite ladies have teamed up and are hosting the Christmas Cheer Linkup! They're going to showcase the spirit of Christmas through crafts, decor, and food! :::: Cassie from Hi Sugarplum! gets the party started on November 29, and you can link up your holiday craft with her! :::: The party continues on December 1 with Courtney from A Thoughtful Place with holiday vignettes. :::: On December 6, join Michelle from Ten June to share your Christmas mantle. :::: Link up your Christmas trees with Megan over at Honey We're Home on December 8.
:::: On December 13, visit Natasha from Schue Love to savor some delicious recipes. :::: Michaela from Michaela Noelle Designs wraps up the party with holiday decor on December 15. Feel free to grab a button and spread the word! And if you're wondering... yes, I did make that super cute and cheerful graphic! ;) I was so happy to work such nice and talented ladies, so I really hope you’ll join in on all of the holiday fun! Don't forget about all the wonderful gift ideas.... and DISCOUNTS!! Check my previous two posts for more info! YAY!! this sounds awesome! Love these girls, and the button looks amazing! this is really cool! i look forward to reading!! i'm so doing this and i can't waitttt! :) i love christmas! What an awesome idea....Ill bookmark and be back for sure!!! That little button is the cutest thing ever....Im doing something similar with fashion blogging....love Christmas!! This is adorable. Great idea. Can't wait to see more. Fun! I need to get my craft on. I'm a lazy bones. You seriously did such a great job designing the buttons!! What a great round of ladies!! Can't wait to see what they have up their sleeves!! LOVE your cutsie button you made!! Oh my gosh! Is there anything you CAN'T do?! :) Love this and all the fabulous bloggers participating! this just such a beautiful idea, might snag that button! oh, and love love your layout for it .. where did u get that adorable Font from? It seems that you're all set for the Holiday Season. Shopping spree is in the air. Have fun!